Cameroon closed in on the quarterfinals of the Africa Cup of Nations by beating Guinea-Bissau 2-1 on Wednesday while hosts Gabon were left still waiting for a win despite another goal from Pierre-Emerick Aubameyang. The Indomitable Lions came from behind to defeat Guinea-Bissau with Sebastien Siani and Michael Ngadeu netting after Piqueti's contender for goal of the tournament had given the debutants the lead. Cameroon now know a draw against Gabon in their final Group A game on Sunday will secure them a place in the last eight after a build-up to the finals marred by the refusal of several marquee names to accept call-ups. Earlier, Aubameyang's penalty allowed Gabon to come from behind and draw 1-1 with Burkina Faso after Prejuce Nakoulma had put the Stallions in front at the Stade de l'Amitie. It was their second 1-1 draw in as many matches. Cameroon travelled to Gabon with arguably their weakest ever squad at the Cup of Nations but Hugo Broos's side played well for much of their opening draw with Burkina Faso and showed great spirit to come from behind against Guinea-Bissau. The west African minnows were heading for their first ever win at the tournament after Piqueti, who plays for Sporting Braga's B team in the Portuguese second division, put them in front in the 13th minute. It was a breathtaking goal as he collected possession midway inside his own half, lobbed one opponent and then outpaced another on his way into the box, where he crashed a shot past Fabrice Ondoa. 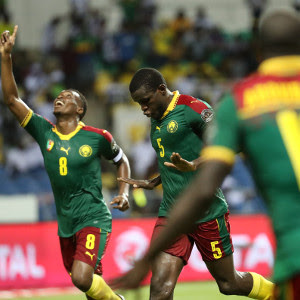 However, Cameroon equalised when skipper Benjamin Moukandjo laid the ball off for midfielder Siani to hammer a first-time effort into the net from 20 yards just after the hour. Ngadeu, the Slavia Prague defender, then fired in a low shot at the near post to win it, although Belgian coach Broos was still not too happy at the end. "Our first-half performance was not worthy of Indomitable Lions, it was more like tame lions," he said. "I have never seen such a weak team. There was nothing, no aggression, no fight. "But I think we deserved to win the game on the basis of our second half. We came here to get through the group." Guinea-Bissau, known as the 'Wild Dogs', now have to win their next game against Burkina Faso if they are to stay alive, although they could be aided by the injuries that have hit Paulo Duarte's team. The Stallions lost star man Jonathan Pitroipa and Jonathan Zongo to injury as they failed to hold onto the lead given to them by Nakoulma midway through the first half in the Gabonese capital. Gabon were level again before the interval, Borussia Dortmund star Aubameyang scoring his second goal in as many games at this Cup of Nations from the penalty spot after being brought down by goalkeeper Herve Koffi. The Panthers had the best chances to win it, not least when Denis Bouanga met Aubameyang's knockdown with a first-time effort eight yards from goal only for Koffi to make a superb block. "The Ivory Coast won the last Africa Cup of Nations after drawing their opening two games," recalled Gabon coach Jose Antonio Camacho. "Maybe it is a good omen. Everything still depends on us. If we beat Cameroon we will qualify." However, Gabon's hopes going into that game have already been hit by injuries to Juventus midfielder Mario Lemina and full-back Johann Obiang, with Camacho ruling both men out of the rest of the competition. The injuries put the state of the pitch in Libreville in the spotlight, but Burkinabe coach Paulo Duarte was philosophical. "The injuries are nothing to do with the pitch or our preparations. That's just football at the top level," he said. The action moves back to Group B in Franceville in south-eastern Gabon on Thursday as Riyad Mahrez's Algeria meet Tunisia in a north African derby in the afternoon. Later, Africa's top-ranked side Senegal know a win against outsiders Zimbabwe will secure their place in the last eight.